The weekend came and went with housework being done, a few phone calls and only one visitor. My housework always just rolls along and curves around everything else that happens here. They say a picture tells a thousand words, so I'll let theses pictures tell my tale. Starting with the sad story of Saturday's bread. Lecithin granules and polenta look the same in their identical glass jars. I sprinkled on what I thought was polenta. Wrong! It was sticky, I knew I'd sprinkled on lecithin but thought it would be okay to leave in the bread. I have never baked lecithin before, we usually have it in our muesli. Those black runny bits are the melted lecithin. I should have scraped it off. 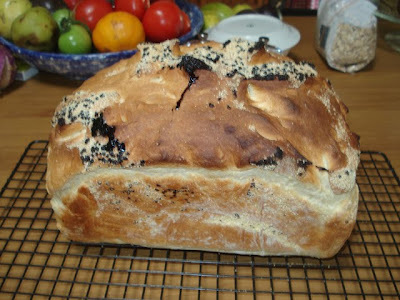 We ate the bread, it only affected small bits on the top. Yet another lesson learned. 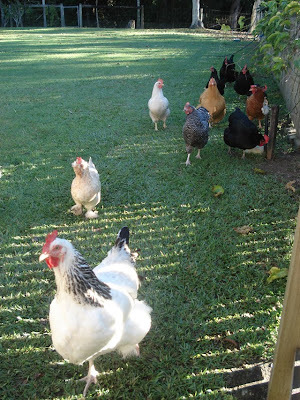 Chook highway when they mistook my camera for food. 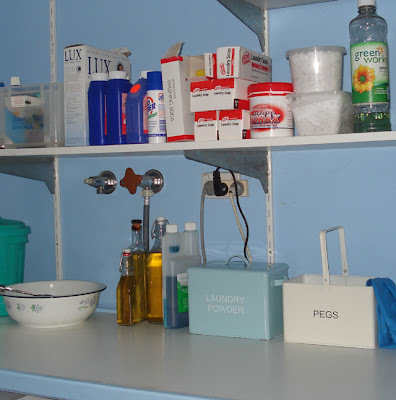 I cleaned the laundry benches, put away the soap I made last week, soaked some curtain linings and did a load of washing. 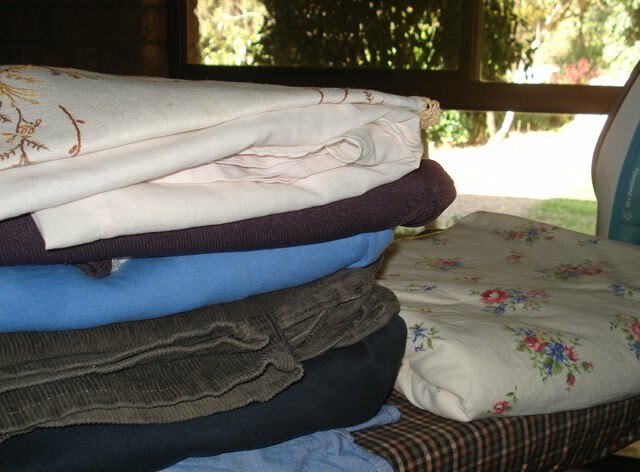 Then folded and put away some clothes and sheets. 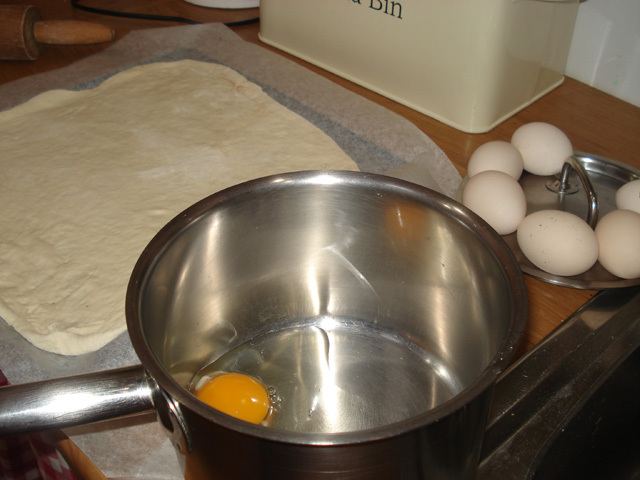 We had homemade pizza for dinner on Saturday night, with egg custard and apricots for dessert. Last night we had poor man's roast - meatloaf with baked potato, pumpkin, turnips, carrots, peas and gravy, and the rest of the egg custard and fruit. I call it poor man's roast because it is just a meatloaf, although you get the impression of roasting meat cooking in the late afternoon. And the added bonus is that we have enough meatloaf leftover for sandwiches during the week. And finally, shhhhh, he didn't know I was lurking inside with my camera while he was working in the afternoon sun. We saved up and bought three timber blinds to replace our very old curtains. Hanno put them up on the weekend and had to adjust the strip tops. I'll take photos of the new look lounge room later in the week. Ooh, what a lovely glimpse into your weekend! Can I ask, what do you use lecithin on your museli for? I've not heard of this before. Shame about the bread though! I love reading about your pottering at home days. I've not been feeling well recently, and have drifted away from pottering around. Sometimes just reading about someone else making soap, washing curtains, baking bread is enough to jolt me back into action. Rhonda, your chickens look so plump, healthy and beautiful! I always love to read what you are up to. Your photo of the chickens reminded me of what happened here yesterday. I free ranged my girls for the first time. It turned into a massive blog pictorial, but it was so interesting to watch how all the animals sorted each other out. Unlike you, yesterday I did NO housework. I just watched the story unfold in the backyard. It was very satisfying. What a nice scene from your wonderful weekend. Thanks for the well wishes for 4th of July. The chooks are so beautiful. It's always enjoyable to see what you're up to. I especially loved the chick highway picture! I've just taken the last jars of jam out of the canner. I started the morning with black & blueberry jam, & ended with peach almond jam. The peach jam got a bit scorched... first time that's happened. But I added a bit more sugar & almond extract, and my sweetie said it's fine. It's good to see things don't always go perfectly for us all! Your days sound very fruitful,abundant but paced. I am afraid that my days are often too busy with too much for one Person to do but I do try and find that slow one job running to another flow. Hannos spot in the sun looks very nice. Of course, there's also my first solution...painters tape and a pen ;) Here's to no more mix ups! Hi Rhonda, I just chuckled at your poor mans roast...we call chops baked with vegetables in the oven 'poor mans' roast at our house. As the lamb chops smell just the same as a leg of lamb....and I must say, taste just as good.....and at the moment feeding my children for with $8.00, sometimes $6.00 worth of chops is a lot better on my shopping bill than a $30.00 leg of lamb!!!! Hooray for poor mans roast I say...Suzanne. OH, my favorite was the "chook highway" :) :) :) That was just too funny!!! I'm going to tell my dad about that one. Hmm.. there's an apartment kitty that belongs to neighbor...but she roams outside quite a bit. In any case, this morning she was trying to get into our apartment AGAIN. She sensed that the door would open soon...which it did...we were leaving for church. She's been doing this now officially for 2 months as of today...two months from the day we moved into the apartment we're living in now :) :) it's too cute..
Hi Rhonda. 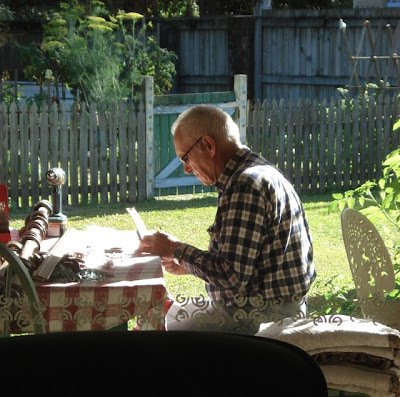 I do so enjoy images of domesticity, simplicity and contentment, such as these. :-) The Highway of CHOOKS was amusing to behold. What a coincidence re the laundry tidy up - I did a similar thing over the weekend. You are so lucky to have a supportive and able Hanno, helping you round the place. My Ricky is a DIY disaster to happen. If anything needs fixing, I better know what to do, as he would make a pigs hash of it. The same goes for gardening. Mine needs a flamethrower now to get rid of the weeds. It was lovely to see what your weekend was like. I recently researched lecithin granules as i had a recipe book that uses them. What I found out very much disinclined me to use them. I thought I'd just mention this as others might have their interest piqued by this post and I'd just say they are marketed as a healthy addition to food but I'm not convinced (no offence Rhonda I hope, perhaps you have researched this also and come to a different conclusion?). 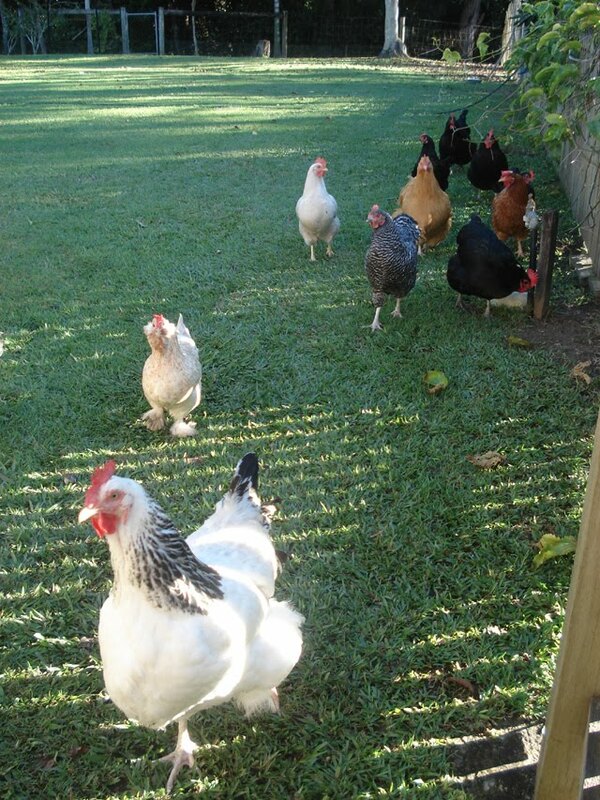 I love the photo of your chooks! That sounds such a productive but calm weekend. Thanks for the tip about the lecithin! I love your healthy and beautiful chickens. Thank you for the Happy 4th of July wishes, we had a great day with family and friends.